Also, THANK YOU to everyone for their wonderful suggestions on my search for structure. All of your thoughts were so incredibly helpful and I am glad that my randomness is not driving anyone crazy yet! I LOVE pink! HATED IT PASSIONATELY AS A CHILD, CAN'T GET ENOUGH NOW!Great post! Oh these are fun. Thanks for waking me up. I agree I like the softer pinks in interiors. I wish that I were brave enough to wear those amazing pink shoes. p.s. i just read your post about structure searching-- i love your random format! I've been contemplating that very thing for my blog too. Yes, yes, yes and yes. OK, thank you I will take them all! I too fell for Cameron Diaz' dress from the Golden Globes! 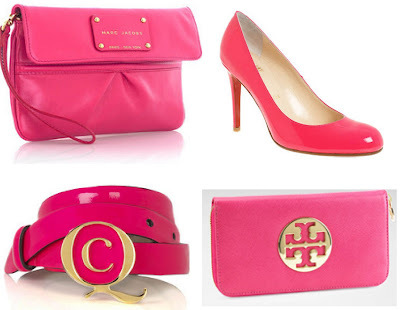 I've always been a pink-lover, but I haven't worn in much in the last couple years. I would love to add any of these items to my wardrobe! Such a fun and happy shade. i don't wear this color enough. i agree with your take—adding it in subtly for that pop of color—with black perhaps? i think i'd be brave enough to try the shoes! Another perfect round-up Blair! I THOUGHT those shoes were louboutin, and sure enough I checked the credits and they were! I love the fresh pink update on their classic patent pump. of course I love anything louboutin, so that's not saying much!